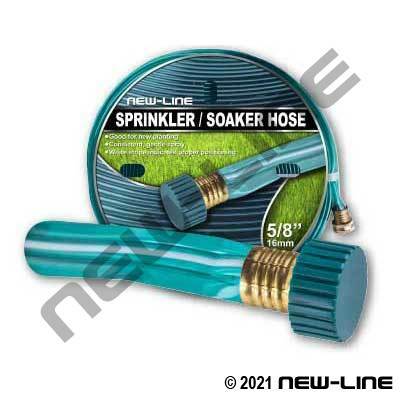 NL2490 is a permanently formed "flat" hose which provides a consistent, gentle spray through tiny holes. The white stripe along the hose indicates proper positioning. Only sold in 25ft and 50ft coupled assemblies. Ideal for spot watering on new grass, gardens, trees, and shrubs. Also used on construction sites for dust control and for keeping concrete moist. It is a light duty hose that is not designed for industrial applications, driven over, abused, and due to the nature of its construction, it is susceptible to performance changes from year-to-year in hot or cold climates, long continuous lengths, water pressures, duration of watering, etc. Typical Fittings: Cannot be repaired due to "flat" construction and 3 tube lines. Each length comes with an end cap. Construction: Tube: Flat, green vinyl with 3 longitudinal sections. Cover: Flat, green vinyl with a white stripe. Reinforcement: None.